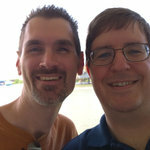 David and I right after boarding the Carnival Triumph! 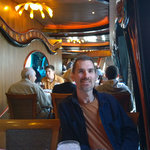 David in our stateroom! (i.e. 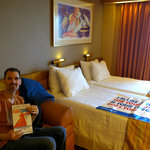 room) He's holding the Carnival Fun Times, which is the daily guide to what's going on all over the ship. David at our assigned dinner table. 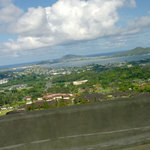 Unfortunately we didn't have much of a view from it. Shortly after this picture we were joined by two guys, one of whom was extremely drunk. 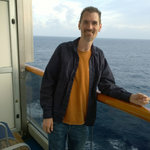 David enjoying our stateroom balcony! 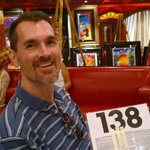 We went to an art auction on board! David is holding our bidding sheet thing, which we didn't really use. Note the woman in the background, who definitely leaned over to get in the shot. 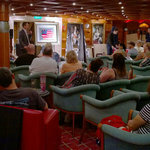 A broader view of the art auction. Space was tight so we sat right up front. 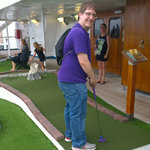 The ship had a minigolf course! It was only 9 holes and a bit windy to boot, but we had a good time. 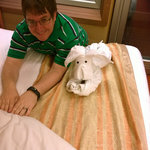 Towel animal time! 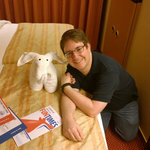 Here I attempt to be an elephant, with limited success. 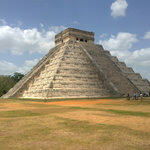 The next day we took a shore excursion to Chichen Itza! 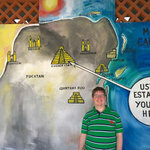 This nice map was painted at a store just outside the site. 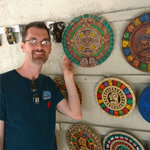 David with some nice Mayan calendars and such. 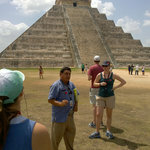 Our guide (who is of Mayan descent) in front of the Observatory! 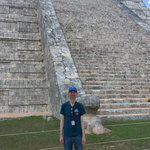 David in front of the steps of the Observatory. One last wide shot of the Observatory. It was quite striking! This is the Mercado, which we think was some kind of market. 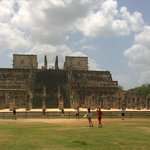 Inside the ball court, where matches were played. 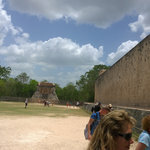 The goal was to get the ball in the hoop sticking out of the top of the wall, which was pretty high up!